Discussion in 'Related Gear' started by 33-1729, Aug 15, 2018. With the Cone Mills closure Levi is going to rely upon the existing selvedge shuttle loom denim stock for their Levi Vintage Collection (LVC) offerings. I suspect that may mean new LVC supplies for the next few years, but I'm not certain. I'm stocking up on the LVC 1947, but what about the Japanese jeans like Warehouse, Evisu (having a sale now), Fullcount, and Studio D'Artisan? What does everyone wear and recommend? P.S. 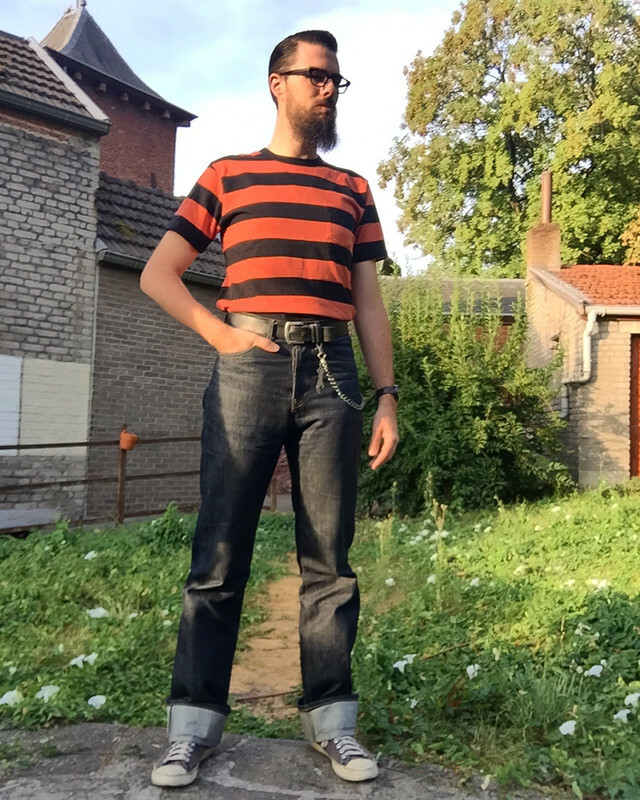 I saw a LVC sizing post that contained a number of vintages and found it quite helpful, especially since I wear a 32/32. It is summarized below with the original post link. Interesting to see a 32" waist may be from 32" to 35" when new, depending upon the vintage. W= waist, R=Rise, L=leg length, Lo=leg opening (measured across hem) S=seat (width just below the front pockets), Th=thigh width 7 inches below the crotch. SimonR and ButteMT61 like this. I seem to have been an Iron Heart man for the last 8 years, love their 25oz denim, especially the overdyed black version. I seem to have built up quite a collection, lol. Art and Boyo like this. 501s don't look very good on me, but fortunately I got my hands on a pair of selvedge 511-s. Love them! Although the thick material is quite restrictive. Art and Flightengineer like this. My favourite at the moment are a pair of Lutece MFG M1937 jeans. High waisted, buckle back selvedge, all for 75 euros. I will get another pair or two, just to be sure not to run out! Art, falcon_ib, Boyo and 2 others like this. Great thread! If you're a denim nerd like me and like to wear the closest thing to 30's - 50's denim you can't go wrong with Lee Japan (if you can find them), Warehouse, Real McCoy's or some of the LVC 501's (although quality has gone down the last couple years). Back in the day Aero stocked a killer selection of the Lee Japan denim which was some of the sickest reproduction denim I've ever seen. Also the MASH Army dungarees are hands down a dead on reproduction of the originals. Here's a couple pics of my old Lee Japan reproductions of the wartime Lee Cowboy pants from 1942. The Lee left had twill denim, high rise cut, steel shank button fly, inverted arcuate and all cotton stitching are all faithfully reproduced. robrinay, Geeboo, ties70 and 5 others like this. I’d love a pair of those wartime Vintage Lee’s Grant. However looking on Japanese sites it looks like the arcuates have gone and the selvedge, for some reason is now yellow! The problem with all the japan manufacturers is that their inseam rarely go above 34 inches. I really love to cuff my jeans, kind of going with the 50's/rockabilly vibe, and in order to do so, I need 36 inseam minimum. That's one of my main issue with the Pike Brothers denim, their 36 inseam is more a 35, and they shrink if not dry washed. That, and their kinda low waist compared to true vintage denims. All in all, I own a couple PB (37 and 58 roamers), an SJC Yard Boss and the Lutece M1937, which, as stated above, is my favourite by far. The SCJ Yard Boss is really, really great too, but it's too big on me since I lost weight. I wonder if someone would be able to take a couple inches from the waist. @Carl From what I see on their website, I wonder if Paradirama's 1927 are not the same as my Lutece 1937, with an ornate stitching on the back pocket and a different patch. Appart from that, they really look a lot the same. Thanks! How can I identify the specific Lee Japan jeans above from others? I see on the Aero page one pair as "Lee Japan", but the others say woven in Japan, so not certain of the difference. The LVC 1947 fit me best thus far, so what would you recommend to try? I understand Denime was bought out by the founder of the Real McCoy's (Hitoshi Tsujimoto), so are they one and the same or different brands? Have you tried Studio D'Artisan, Pherrow's, etc? Any Warehouse favorite? 75 euros? Those are some expensive jeans. 501s always work for me. They also work for the ladies based on this old quote. "Tight butts drive me nuts!" Stony, 501s are around 100EUR in Belgium, so no, 75EUR for a pair of good sturdy denim trousers is not expensive at all. Believe it or not, Lee Japan is completely accurate offering the wartime Lee's with no arcuate and yellow selvage. As in A-2's during the war, there were all kinds of variations. BTW, I own a pair of 40's Lee dungarees with yellow selvage. Strange but true! The 34" inseam measurement (at least in Lee Japan and Real McCoy's denim) is completely misleading. Given the higher rise, the actual inseam is much longer than listed. I'm 5'11" and always have to have my Japanese denim chain stitched hemmed, even with a decent cuff. Here's a pic of my Real McCoy's 1947 Lee's which had about 4" trimmed on the 34" inseam. Flightengineer, stanier, Boyo and 3 others like this. In spite of some misses, the guys at Gustin have made some fantastic jeans. I have about 8 pairs, and they are just a cut that works for me. I have a couple I'll get shots of as they are fading/wearing wonderfully. Sadly, guys with 40x35/36 are hard to outfit. I tried Iron Heart once locally, but I honestly could not justify the price. Nicely made, but out of my denim price range. Those up above look see though. Write me if you need to unload some trou. I'm 40x30 myself. Only being a 29 inside leg , i have no trouble getting big cuffs on my jeans !! You know, I never cursed my height until I got into vintage clothing. Now, I sometimes wish I was 10cm shorter! Same inside leg as me Carl! And I have lurvleee cuffs too, now ain’t that strange!